Windy Run watershed in north Arlington. Construction is nearly complete. The trail has re-opened. Read an article about the project! View the 100% design plan. Stream erosion is enlarging the stream channel, washing sediment downstream, and undermining trees along the stream. This stream restoration project helped to address severe stream erosion that’s threatening trees and a sanitary sewer pump station along the stream, causing trail and slope damage, and exposing sewer lines. A technique called “natural channel design” will be used to create a new stream channel that’s in balance with the runoff it receives from the surrounding land. The stream will be raised up to reconnect it with a floodplain area. During higher flows, the stream can flow onto the floodplain and the water will slow down and reduce its energy. In addition, step pools structures will be added with rocks that help reduce the energy of the flow. We’ve completed a similar stream restoration project on Donaldson Run. This project will also help the County meet its regulatory requirements to reduce nitrogen, phosphorus and sediment pollution. The County’s MS4 Permit requires reductions in nitrogen, phosphorus and sediment pollution. Stream restoration projects are especially effective tools to address phosphorus and sediment pollution. Arlington’s pollution reduction efforts are a part of the larger Chesapeake Bay cleanup effort. View a map of the stream restoration area. Realign sanitary sewer to eliminate “hanging” crossing. Erosion has undermined the stone wall along the trail and it has collapsed, threatening the trail. Stabilize bottom and top of slope below trail with stacked stone. Extend storm sewer under trail to connect to stream at stabilized outfall. Repair failed storm sewer endwall and gully. 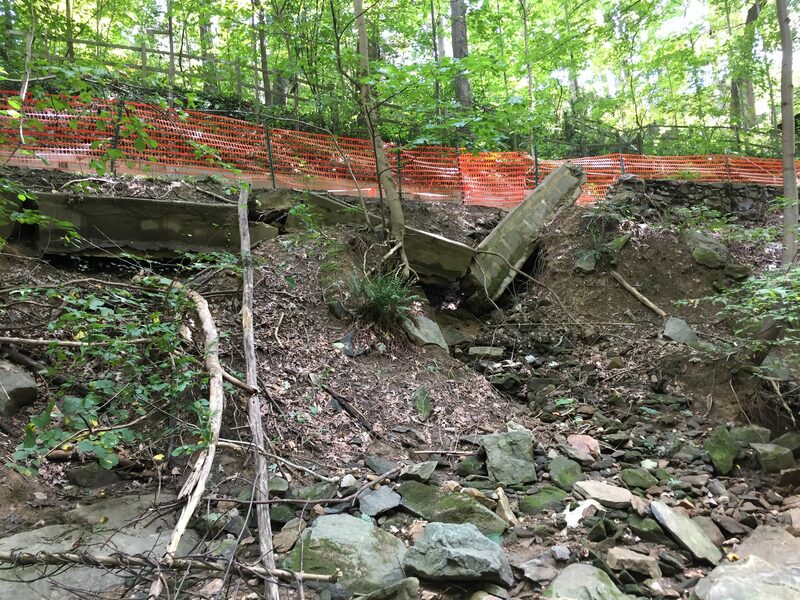 Reconfigure two other existing storm sewer outfalls for improved stream connection and stability.Stream erosion has undermined the stone wall along the walking trail and it has collapsed, threatening the trail. A total of 90 trees exist along the Windy Run stream bank within the project area, many of which are already threatened or compromised by erosion. Trees with reasonable survival chance will be protected during construction and saved. Approximately 34 trees greater than 15 inches in diameter will be removed. The minimum tree replacement for this project is 95 trees. Trees with reasonable survival chance will be saved, and some design adjustments may be made to try to protect existing trees. The project will include an invasive plant management plan, and a planting plan for native trees, shrubs, and groundcover.